Welcome to the fantastic vacation community if Laurel Branch, located in Pigeon Forge, Tennessee. 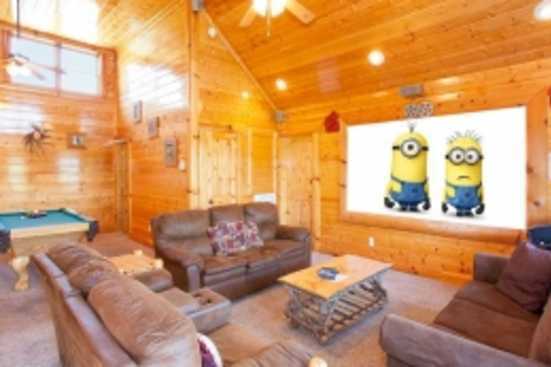 Laurel Branch features log cabin rentals that can accommodate between eight and eighteen guests depending upon the property. These cabins feature large decks for viewing the gorgeous forestry of the area. They also feature full kitchens, wifi access, hot tubs, game rooms that include pool tables or air hockey, and so much more. The log homes are only minutes away from most of the prominent attractions of both Gatlinburg and Pigeon Forge! Vacationing in Pigeon Forge, Tennessee is sure to be a fantastic time for groups of all ages. Families vacationing with children are encouraged to head into downtown and race go-karts. After racing the go-karts consider checking out of the many miniature golf courses for a round of eighteen. For adults looking to hit the links, we at SMBYO.com suggest visiting one or more of the many local golf courses in the area. Looking for a truly unique shopping expirence? Head to the art district in Pigeon Forge and peruse the unique selection of painting, woodwork, leatherwork, and much more. Pick a special handcrafted piece of local artwork and bring it home to commemorate your vacation! Book Laurel Branch log cabins in Pigeon Forge, Tennessee with owner and save! Booking directly with the owner allows guests to receive the best rates and save money by cutting out unnecessary fees.